U.S. oil rigs in service rose 2 this week back near a new cycle high as U.S.oil production remained at all time high of 11.70 million bpd. US Natural gas rigs fell 5. Oil rigs fell 5 in Canada. Bottlenecks remain in the Midland Texas area. Total North America rig count Fell 8 to 1275 up 124 year on year. Canada took off 5 oil rigs to 119 in the past week General Electric Co’s Baker Hughes reported. In early May analysts at Simmons & Co, the energy unit at U.S. investment bank Piper Jaffray, raised their forecast for the average total oil and natural gas rig count to 1,020 in 2018 and 1,135 in 2019, up from an earlier projection of 1,015 in 2018 and 1,130 in 2019. The total number of oil and gas rigs active in the United States has averaged 983, up sharply from the average of 876 rigs in 2017. This pace forecasts the highest rig count since 2014 when it averaged 1,862 rigs. 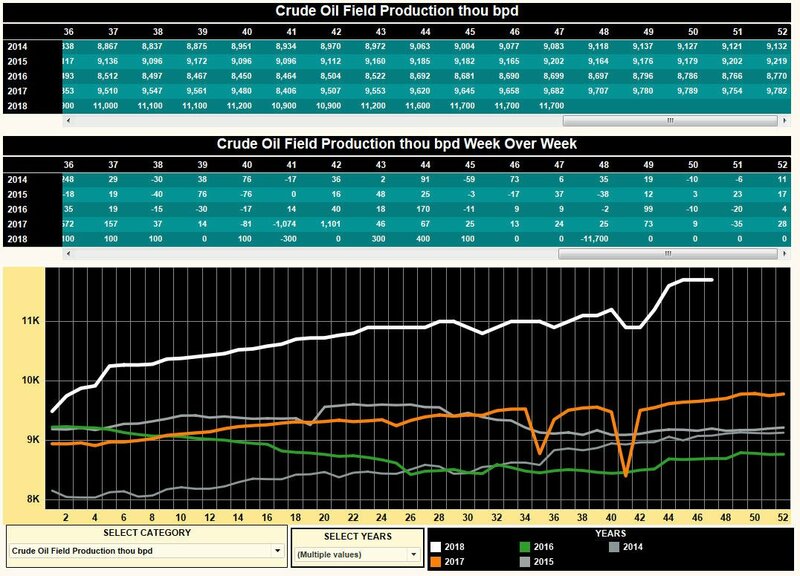 Shale output is forecast to rise to 7.714 mbpd in November, a monthly increase almost 100,000 bpd. A long way from 2008, shale production in the US has risen by 5.7 mbpd whilst total crude oil output is up by more or less the same extent. Plainly stated the shale industry is responsible for 100% of the growth. From 2017-to-date shale production has produced only one monthly decrease, in January 2018 when output was down 64,000 bpd on the month. Current LTO output makes up 70% of the total US output. This compares with 30% 10 years ago.